Welcome to the website for the Nunavut Marine Council, a collaboration between Nunavut's Institutions of Public Government. The objective of this website is to provide access to the Nunavut Marine Council, its outgoing and incoming correspondence, background materials and associated materials. The NMC intends to also utilize this website to improve the access for Nunavummiut to relevant resources and information related to Nunavut marine areas. November 19, 2018: Since the launch of this website, the Nunavut Marine Council has been actively engaging with Inuit, Government, and other partners to increase awareness of the Council’s role in marine management and to investigate potential partnerships and funding opportunities related to protection and promotion of Nunavut’s marine areas. 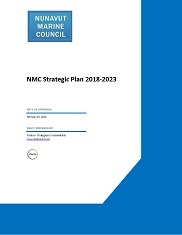 The Nunavut Marine Council has recently developed a strategic plan to outline the existing role of the Nunavut Marine Council as well as a vision for what it could accomplish with additional resources moving forward. The Nunavut Marine Council Strategic Plan can be accessed through the Documents tab or by clicking on an icon below. We invite you to explore the website and connect with us by sending a message through the form on the website main page, or by emailing us at info@nunavutmarinecouncil.com. The Nunavut Marine Council wishes to increase public awareness and engagement regarding marine issues. By choosing to get involved and providing your questions, comments and advice to the following initiatives, you can assist in the protection and promotion of Nunavut’s marine areas. You can also contact the NMC directly to notify us of any ongoing initiatives we should be aware of and consider participating in or sharing with our network.